I want to make a lap quilt for a friend going through chemo. I have some lovely floral prints and some greens that could be used. I just cannot find a pattern that I like. Any suggestions please. Are you wanting something challenging with lots of triangles, or a nice simple Boxed Squares type thing? Hole in the Barn Door springs to my mind. It's kind of half and half. I googled just that! Floral lap quilt pattern and got over 1 million hits! If you get stuck, try that and good luck. Churn dash blocks in florals with a white background look really good. I made this floral one for a friend of a friend who was in Hospice care. I don't remember what the pattern was, but you might be able to design something similar? To me, the floral size would dictate the quilt pattern choice. Is it large, medium or small. I'm just working on quilting a couple of quilt tops I made for gifts using Angela Walters Coral Reef free pattern. I had some Asian inspired floral fabric to use and combined it with a solid background. I'm quilte happy with it. Just google it, you'll find it and see if it appeals to you. It's a very straight forward pattern of squares and half square triangles, but looks really nice made up. Last edited by Kwiltr; 05-09-2018 at 08:22 PM. 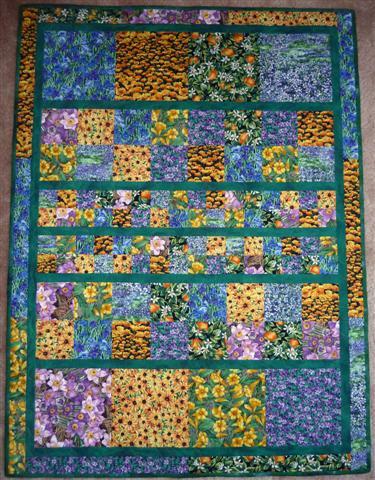 I love the log cabin quilts made with florals. https://quiltville.com/pdf/floribundapdf.pdf Florabunda by Bonnie Hunter. It is not hard but looks stunning. Maybe you can use the green instead of the yellow. This quilt is still on my bucket list. This is lovely. I have some florals in my stash that I need to use and this pattern is perfect. Thank you for posting the link. What an amazing group! Many thanks for all your suggestions. I have picked the one I want from your suggestions. I will get back to you in a few weeks with a photo of my quilt. I am making a quilt with blocks with a flower and green leaves. It is turning out so pretty even if I say so myself LOL! It is a Jenny Doan tutorial from Missouri Star Quilt Company. The pattern is called Prairie Flower. Good luck on your decision. I like the Walk About pattern, but I LOVE this one in florals! Jordan fabrics just posted a new split rail with pinwheels tute today that is done in florals and very cute. They offer the pattern for free. I love her tutorials. Looking forward to it. Oh, the suspense! I have the top of my quilt made. I think it looks lovely! I have decided to use a fabric called "fireside" which is similar to fleece but does not stretch so much on the back. I thought I would not use a batting but after tacking it together it feels a little thin. Have any of you used this fabric and have your put batting in? If so what kind of batting did you use? Your post inspired me to pull out my collection of rose fabrics and I'm so pleased with the results. I love florals and have so many, but until lately haven't actually used them a lot. Summer is the perfect time for flowers!!! Hugs and smiles!